Krav Maga self defense DVDs - Direct from Israel. Note: If it is not on this page, it is NOT an IKI DVD. This is the ONLY source to purchase authentic IKI DVDs. Join IKI on line and receive daily updates and step by step Krav Maga video tips. The long awaited DVD, the IKI approach to ground defense. Should be ready within the next month. Philosophy of Ground Defense - This is not MMA, this is not sports or competition, this is about survival. Period. Practical simple defense on the ground, get up, get away. Defense vs: side control, scarf hold etc. Arthur Cohens' Down and Dangerous. Fight back and escape from the ground position, get back on your feet. We have taken the lessons and experience from the past years and totally updated the basics of Gun defense. Gun to the head, body, from all angles. New and up to date. Hostage situations, knife and gun threats, knife attacks, fighting in confined spaces, fighting while seated. 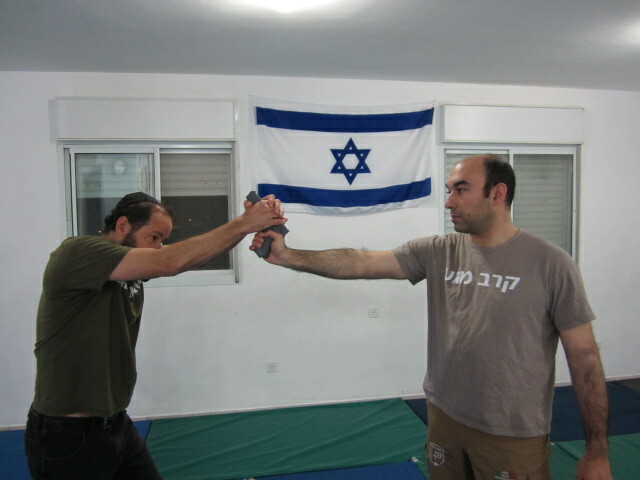 Everything you need to know about IKI Israeli Kickboxing; stance, punching, kicking, defense, drills. This is our Kickboxing curriculum for all ranks. Chokes, Grabs, bear hugs, wrist grabs, being pushed or pulled, hair grabs, head locks and more. 52 clips. Defense vs striking; punching, kicking, surprise attacks. Simple and effective defense vs all types of unarmed attacks. Krav Maga kicking, punching, striking. Use arms, legs, hands, forearms in the most effective way. Note: This has been replaced by our 2018 version, but this does have value for those who want to see how IKI has developed over the years and how much has changed and developed in 4 years. "I can say without reservation that this is the best DVD you have produced (my opinion of course). The quality is excellent and the explanations are extremely well done. Some of the techniques are those we have all done for a while but there are a number of subtle new ‘tweaks’ that are extremely valuable and effective along with a number of new attack scenarios. From someone who practices IKI techniques a great deal and who teaches 4 to 5 days per week I can say with some degree of authority that anyone involved in IKI who does not get this DVD is missing a great deal." Totally new, updated, revised. This is the current IKI Defense vs. Knife Attacks DVD, and it replaces the 2014 version. Covers knife attacks from all angles, all grips, all directions. Includes recent knife attacks from Israel and around the world. Very extensive. Topics: Hand gun held close to body. Grab plus gun threats, against the wall, analysis of gun defense plus many unusual but important situations. These are the answers to questions asked by IKI members from around the world over the past several years of touring. Defense vs. Knife, Ax, Stick, gun attacks. Defense vs active shooters with handguns, rifles as well as attackers with knives and axes. Realistic scenario training based on actual incidents in Israel and around the world. We use the Israeli method of counter attack. Note: This is a CD/DVD plays only on the computer. Defend vs attacks in your car. Special prices for IKI Instructors buying in bulk (10 or more of a single title), contact me directly for details. Sell to your students. The DVD arrived last week and I have finally got to see it ! Congratulations on a job that is very well done ...it is one of the best Krav DVD’s I have seen! Your instruction style on the DVD reinforces my belief in the IKI system it isn’t tough guy Krav it is common sense Krav! Moshe: I only got a chance to look at the first few chapters last night and have to head out to meetings this morning. However, based on what I have seen I want to congratulate you immensely on an absolutely great job! There is MUCH to learn from your demonstrations and dialogue! Any IKI member (or, frankly any IKI student) who does not get this one is missing out on a great deal! Can’t wait to view the rest…..
"I'm just writing you to thank you for making the DVD. I just finished watching it for the first time, and it answers A LOT of questions that I've been wanting to ask. The drills also look great, I am really looking forward to practice." Many simple and high effective techniques to use the Kobutan key chain in self defense situations. Easy to learn and apply. Make your key chain the "great equalizer" on the street. This CD deals with the most effective knife defenses. After viewing this DVD I must admit that all techniques are simple, practical and easy to perform, as to be expected. Important aspects as controlling the knife(arm) are found in almost all techniques. There is also a focus on escaping as to fighting. 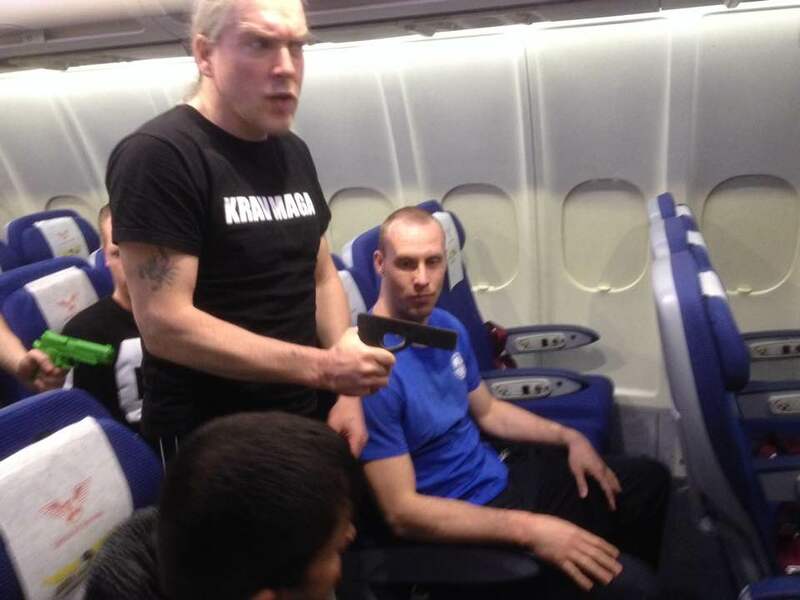 Specially some of the knife threats in the end are very interesting to watch and are useful input for training. It goes further than the regular KM curriculum of the major systems. 110 minutes covering hand to hand, knife and gun. A 3 DVD set, filmed, edited, and arranged by IKI Instructor Tim Hillis. Added slow motion and detailed explanations by Tim Hillis. Covers many basic techniques, gun and knife disarms. $28 plus shipping and handling. A compilation of the techniques sent out over the past years, plus new previously unreleased clips and expanded bonus clips. This offers more detailed explanations than on our clips sent out via e mail. Joe Stronsick Watch and re-watch hundreds of times... there are those little details that make the techniques so magically powerful. Keep producing them Moshe. I have more than 30 years of experience in martial-arts, all kinds. And I must say that your approach is completely different. I love martial-arts and there it's more to me than only realistic fighting, but also mental and physical control, sport, learning to reach goals...and I love master techniques. But always I had my own thinking of realistic fighting that differed from a lot of other teachers. They founded new styles based on old styles and made complicated and good looking techniques. I always had a question mark and thought that real fighting isn't mastering sophisticated techniques but train, train, train real situations, learn principles, use basic techniques and repeat with unknown situations. And most important 'train your mind', the real fighter is between your ears. Read situations, observe the environment, learn to make quick decisions and go for the decision observe - decide - act - handle. Set beside your ego, go away if you can, but if you can't 'act'. Surprisingly on your DVD’s i see a similar approach and therefor I have the feeling that this was the missing piece for me. It completes my training. A quick note to let you know your package arrived last night, thank you kindly for both the DVD's.It was a strange and blessed day yesterday, one of those ones where you stand back and recognize that god has really shined a light on the day. I think you of all people understand this.